LONDON--(BUSINESS WIRE)--The global digital marketing courses market is expected to grow at a CAGR of above 12% during the period 2018-2022, according to a new market research study by Technavio. The report presents a comprehensive research of the global digital marketing courses market by courses type, including academic courses and certification courses. The report also determines the geographic breakdown of the market in terms of detailed analysis and impact, which includes key geographies such as APAC, the Americas, and EMEA. The increasing number of people adopting digital media is one of the major factors driving the growth of the market. Digital platforms have become crucial in today's digitally connected world. Companies are increasingly adopting various digital marketing tools and techniques to help them add value to their products. Several companies are opting for social campaigns on digital platforms, which is increasing their spending on digital advertising. In emerging countries, the cost-effective solutions provided by the incorporation of digital marketing campaigns is the primary reason for the growth of the market. Digital marketing courses are becoming popular among companies as they are proving it for their employees to generate higher ROI from their marketing campaigns. Players in the market are providing customized digital marketing courses to capitalize on the market. These players provide different learning solutions such as online learning, virtual learning, and social learning along with traditional classroom-based learning. The popularity of eLearning has attracted a sizable customer base. In countries such as India, the UAE, and China, many manufacturing and service-based MNCs have increased their presence and are expanding. A major threat to the global digital marketing courses market is the advent of open source digital marketing courses. These free sources refer to various courses materials and MOOCs that provide digital marketing concepts, techniques, and tools that can be used by learners free of charge. Players that offer digital marketing courses suffer a negative impact on their revenue, owing to such free sources. 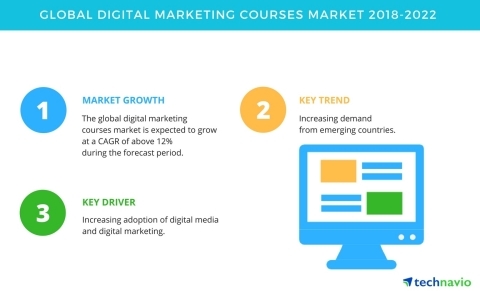 The global digital marketing courses market is expected to grow at a CAGR of above 12% during the period 2018-2022, according to Technavio.